Floyd Mayweather Jr wins the much anticipated boxing match of the century against the Filipino Pride, Manny Pacquiao with a unanimous decision. Boxing fans crowded the MGM Grand Arena in Las Vegas while the rest of the world get together in front of their television screens full of excitements and expectations with beer in hand or popcorn in a bowl. The center of the ring stages the punches, footworks and jabs of the two most iconic boxers in the globe todays. Money is not the only one at stake but also the glory of each fighters as they are also nearing their retirement. Floyd Mayweather Jr tried to defend his record of 47-0, 26 knockouts from Philippines’ underdog Manny Pacquiao with 57-5-2, 38 KOs. It had been five years since the crowd tried to push the two boxers to make the fight a reality and now the fight is the biggest boxing event of the century. In the weigh in, Pacquiao who was hailed in General Santos City, Philippines weighed 145 pounds, while America’s Mayweather weighed 146. Gail Banawis and World Chorale sung the Philippine national anthem, while Jaime Foxx sung the Star Spangled Banner of USA. Celebrities seen in the arena are Paris Hilton, Sting, Nicki Minaj and many others. Manny Pacquiao had been introduced by HBO’s Michael Buffer while Floyd Mayweather was introduced by Showtime’s Jimmy Lennon. Pacquiao had a hard time going inside to attack Mayweather but was able to land a left in the first round. He was aiming for the body shots. Mayweather was able to land a right and Pacqiuao was able to land a counter with a jab. The first round went to Mayweather’s aggressiveness. The round two started with Mayweather landing a left hook on Pacquiao but the Filipino Icon also landed his left on him. Mayweather was faster than Pacquiao at the start. Pacquaio was able to get in and tried to be more aggressive, but the American boxer was still faster. Mayweather landed a hard right on Pacquiao’s waistline in Round 3. The referee gave him a warning. He then received another warning for holding behind the head. Pacquiao was able to get on the game on Round 4. He received a standing ovation after landing a clear straight left on Mayweather. Money Floyd seemed wobbly for a bit. Round 5 started with Mayweather getting slower but was able to land a right hand. He was able to counter well against Pacquiao who is having a hard time giving out more punches. Mayweather was hit by Pacquiao’s left in Round 6. Mayweather put up his defense against PacMan’s power punches. Pacquiao was unable to block the aggressive punches coming to his head in Round 7. Mayweather’s lips bled with Pacquiao’s left and also received another warning from the referee. PacMan was able to let off more punches in Round 8 and Mayweather puts up his defenses again, unable to counter as much. He landed a left hook on Pacquiao while Pacman landed a right. Mayweather soon was able to get back and flurry punches. Round 9 was pull of punches and counters. Many wished for Pacqiao to knock down Mayweather but it was impossible at the point. Pacquiao seemed to have had a hard time to punch in angles. 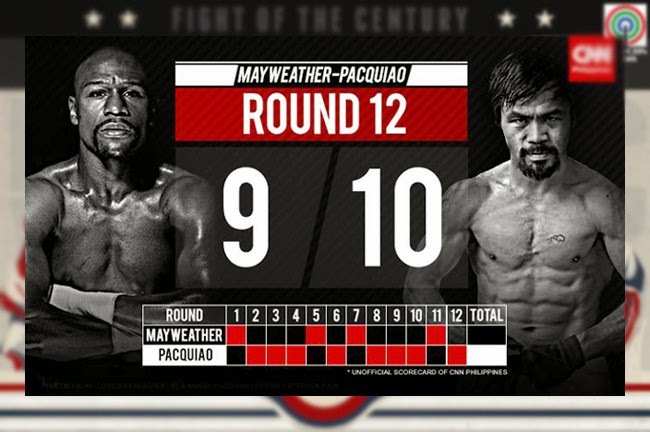 Round 10 was the same, full of punches and counters yet no knock outs. Pacquiao got too slow in Round 11 but was able to block some punches. In the last round Pacquiao tried hard to break Mayweather’s defense and threw jabs and left straights. Mayweather landed too many of his classic rights. The fight decision landed of the scorecards of the judges. In the end it was Floyd Mayweather who had risen to the victory and is still the undisputed boxing champion. Filipinos still expressed their pride for Pacquiao’s hard work, determination and patriotism.